Our residential electrical services will keep any type of home functioning perfectly. If you're looking for a local electrician to handle all your home electrical needs, Marlock Electric is here to help! We provide a variety of quality electrical services in Greater Rochester area, and we can help you with your next home improvement project, keeping your house up to code, or any other issues you may have. Our experienced professionals will help you install the right features for your home and ensure that all aspects of your wiring are working correctly. If you need any electrical services, give us a call at 1-844-747-2911 or click below to get started. We offer free estimates on all our work in Farmington, Victor, Mendon, Geneva, Rochester, Ontario, Fairport and the nearby areas. "As the owner of Pinnacle Homes, I feel that our selection of quality contractors is a direct reflection of the custom homes we build. We have used Marlock Electric for many years and they have always provided a craftsmanship to the electrical trade that our demanding customers expect. Their interaction with our clients is always professional and knowledgeable. We consider Marlock Electric to be a respected team member of Pinnacle Homes that allows us to stay on top of our game." "Once again, we thank you for an EXCEPTIONAL experience and beautiful work done with our garage wiring. We really enjoyed your crew and will highly recommend your company to anyone we come across needing electrical work. Bravo!" "Marlock Electric is the only electrician that we use. He is very professional on our sites, provides exceptional service and provides fair and consistant pricing. Constructing a project while the homeowner continues to live in their house is very challenging and Mark has always been available to meet with our customers to ensure a quality project and ease any concerns that they may have. Our customers continually give us positive feedback on the excellent service they receive from Mark and his employees." "Marlock Electric has worked for our company for several years. Mark and his crew have completed many different types of electrical work for our company including new homes, additions, generators, street lights, repairs, trouble shooting, and replacing electrical services. Marlock Electric is a professional, ethical company that we have recommended to friends and colleagues alike; they are the electrician of choice to complete work on our personal residences." "Mark Lockwood is the best electrician I have worked with. All my customers have nothing but good things to say about him and his team. I have found that his company retains very clean cut people who are extremely professional." Darryl Triou, Triou Custom Homes T.
This cottage home was remodeled with "family" in mind. The area pre-build was a tiny and cramped space and now allows for friends and family year-round for a quick get-away or a long relaxing vacation. The lighting added gives the fireplace area definition and class. We received this call from Manchester, NY stating that the customer was losing half power to their house. Upon arrival the technician noticed a weathered service cable leading into the meter cabinet. Due to the weathered service cable the water was entering the meter cabinet through the damaged cable causing corrosion inside the meter cabinet and led to the power loss. We corrected this by installing a new entrance cable and meter cabinet, and the problem is no more! Marlock Electric was called to troubleshoot flickering lights in a house and occassional power loss. Upon arrival we noticed a crack in the service entrance cable leading from the meter to the panel box. This crack had allowed water to enter the main panel and caused corrosion to the panel which therefore caused these problems. Marlock Electric replaced the cable as well as installed a new 200 amp main breaker panel to correct the problem. The customer was very pleased with our response and quality workmanship. This beautiful outdoor lighting upgrade in Newark, NY added to this colonial style home to better illuminate the front of this customers home. The before and after shows how much more visible the house is from the street view, complementing the home's architecture, increasing security, and helping guests navigate their way to the front entry. Marlock Electric technician recently installed a new 100amp overhead electric service including interior electric panel that was both outdated and unsafe. The panel that was in the house contained outdated and electrically unsafe fuses. This service was brought up to date with panel and circuit breakers. If you have one of these outdated electric panels, we highly recommend replacing it. Marlock Electric was sent to a home in Newark, NY where the service entrance cable on the side of the house was falling and in great disrepair. We see this often due to the weather in our area and are asked to also place meters on the exterior of the home, as the older homes are primarily in the basements. We were able to install a new service for the customer as well as place the meter on the exterior so that the power company can read it without having to gain entry into the house. This Penfield homeowner experienced wind damage to her exterior three light post lights in the back of her home. The decided to replace the old and worn out lights with newer and more energy efficient LED light posts. We supplied this customer with an upgraded panel and were able to bring the meter to the exterior of his home for easier access for the electric company readings. The job was completed in only a couple of hours and the customer was truly pleased. Recently purchased formal dining room upgraded lighting was requested by the interior decorator to give the room a more illuminated area when guests conveign in the room. Several new can lights were added along with dimmers to give the room a subtle glow when needed as well. The new can lighting compliments the beautiful crystal chandelier that will hang over the formal table. 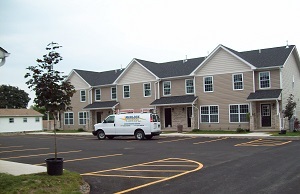 As a new housing complex is being erected, Marlock Electric, Inc. is working hard to complete the six buildings and recreation center for the 33 unit development now in phase II. The units are all newly built and will serve the community at large. We are a proud partner for this project and look forward to its completion in the very near future. We were called to a home in Sodus, NY for concerns with an exterior service cable and meter enclosure that was frayed, pulling from the house and very much worn out from years of weathering, as happens in Upstate New York. Water had been running down the cable and entered the meter enclosure which in returned caused damage as well as a safety concern. Our service technicians installed a new riser cable as well as a new meter box. As you can see here, a much safer situation for the homeowner with these much needed repairs. Full house wiring: From home entertainment systems to recessed lighting to remodeled rooms, we can handle all types of major upgrades to your home's electrical systems. Construction and additions: If you're building a new home or putting an addition on your existing one, we can provide complete wiring services for all features you're adding. Service panel upgrades: If you have any issues with your main service panel, we will provide an effective repair that ensures your home meets all code standards. Full house generators: Installing a full house generator means you won't have to worry about losing power during the next storm, giving you complete peace of mind. Outdoor wiring: If you need lighting around a deck, pool, garden or other outdoor area, we can install a variety of outdoor lights to solve all your needs. No matter what type of electrical work you want for your home, Marlock Electric are the local experts you need. Our complete electrical services will keep your home running smoothly with all the features you want. Call us today at 1-844-747-2911 or contact us online to get a free estimate on all our electrical services. We proudly serve in Penfield, Pittsford, Newark, Walworth, Waterloo, Macedon, Seneca Falls, Canandaigua, Perinton, Webster and throughout the surrounding areas.